"THE HUNGER GAMES WITH VAMPIRES"
Being a killer wasn't what eighteen year old Selena Grey ever expected she'd become. But with her stepfather's blood fresh on her hands, she finds herself walking into an eight by six prison cell where she'll live out the next twenty five years of her life. When a man as beautiful as he is terrifying walks into the prison, Selena is the only one seemingly unaffected by his charms. But Varick's impossibly dark eyes are trained on her and her alone, frightening Selena of what his presence forewarns. It's not long before she finds out as she wakes on a ship in the dead of night, a captive of the forbidding Varick who seems more beast than man. 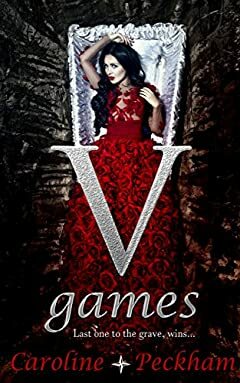 V GAMES is the heart-pounding first instalment in The Vampire Games Trilogy. A YA paranormal romance full of suspense, action and mystery. Perfect for fans of A Shade of Vampire, The Hunger Games and Vampire Academy.